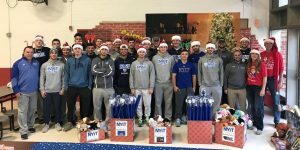 DIX HILLS, N.Y. — The NYIT baseball team pitched in as volunteers with the League of YES this past weekend. The student-athletes attended Saturday’s Breakfast with Santa event. It marked the second consecutive year that NYIT baseball players and coaches donated gifts and attended the event as BUDDYs. The League of Yes’ mission is to establish and sustain baseball programs for people of all ages with disabilities. The objective is to provide an opportunity for those individuals to experience the joy and benefits that come from playing the national pastime. The aim is to help the league’s players develop social skills and increase self-esteem. BUDDYs, including the volunteers from NYIT, protect and assist the players. The League of YES has fall and spring seasons. The group plays at handicapped-accessible athletic fields at Eisenhower Park in East Meadow and at the Brookhaven Amphitheater field in Farmingville.